I was introduced to harmonica as an undergraduate at Yale in the 1970’s. Jim Fitting, a well known Boston based player (Treat Her Right), was there, and captivated me and everyone else with his amplified harmonica style. I bought a harmonica, and got started. Phil Bloch, the Vermont based fiddler, was also there, and introduced me to bluegrass. Back then it was hard to find harmonica lessons. A key early influence then (and now) was my brother Quentin Eyers, a very fine guitar player, music producer and recording engineer. I returned to Australia in the early 1980’s, and started playing harmonica in electric blues bands. I formed the Fulll House Blues Band, which became well known in Adelaide, with a weekly residency at the Britannia Hotel. Sadly, the room we played in is now full of poker machines. I moved to Sydney at the end of the 1980s, where post graduate studies interrupted my music for a while. 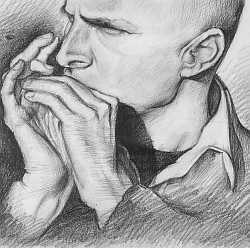 I returned to the harmonica in the mid 1990s, and was drawn to acoustic music. My friend John Bridgland introduced me to bluegrass fiddle tunes. I’d tried learning these on harmonica some years before, using 1st position, but found it too hard. This time I tried a variety of tunings to make things easier, before settling on the one I now use. Along with the harmonica, I have a strong interest in baroque recorder. This began in Washington DC the year after graduation, following on from choral group singing at Yale, directed by Chris Zimmerman. I now perform regularly on recorder with Balmain Baroque, a baroque group I formed in 1995 with Amanda Muir. We are a six piece ensemble, with concerts based around Amanda’s singing and the musical direction of our harpsichord player, Nigel Ubrihien. The baroque training has greatly influenced my harmonica style. I am also fortunate to have been taught by Hans-Dieter Michatz, who provided deep insight into baroque styles, and musical performance. I am the founder of a Chinese harmonica teaching site www.kouqin.com.cn (kouqin is the Chinese pinyin word for harmonica). This site has become very popular. I have also created an English language harmonica site called Harmonica Academy, which provides online harmonica lessons. If you are interested in learning, please visit this site.